As I prepare myself for another trip down the rabbit hole with ds106, I had to remind myself that there are still a plethora of amazingly great resources out there to share with teachers, parents, and others that want simple, practical ways to update their curriculum, or replace static learning experiences with much more fluid or real world experiences. Thanks to the Google Earth blog (one of my personal favorites), comes news of a way to track sea turtle migration via Google Earth. Better yet, if you’re running a relatively up to date computer, you can use the web browser embedded map to track the sea turtles without having to fire up Google Earth itself. The interactive map has you following Jklynn, a female hawksbill sea turtle, as she makes her annual migration through the Caribbean. 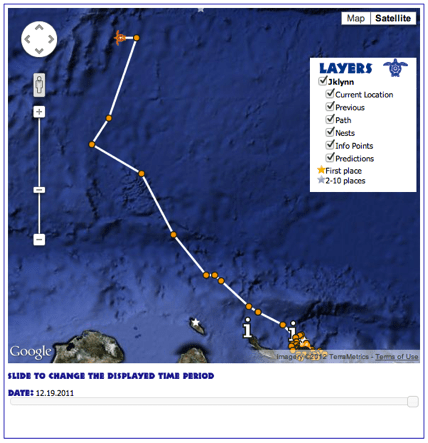 The map includes her previous locations, where she’s at currently, nesting sites, and includes a handy slider to view where she was at any given point in time. Amazing what satellites, radio transmitters, and the internet can give us in this day and age, eh? This would be a fantastic resource for secondary biology teachers talking about the habits and migration patterns of specific animals, although I could easily see an elementary teacher using this resource to show the basic idea of migration, and how it’s not just a thing birds do. Oh, in case you’re a heavy Twitter user, you can follow Jkylynn via her Twitter feed; apparently she managed to slip her tracking collar off back in December and was quite proud of it!